nScrypt’s SmartPump and the 3Dn printer promise to deliver the precision to enable design engineers to print complex, conformal circuits on most surfaces. The photo shows antennas printed along the top and sides of a rough-surfaced Kevlar helmet. Image courtesy of nScrypt. Printed electronics developers have started launching the technology into the third dimension, throwing off the constraints of flat, 2D architectures to integrate electronics directly into a product’s geometry. Until recently, electronics companies designed and manufactured components, systems and layers in 2D. Then they finished off the lengthy process by performing steps like drilling, pressing and plating to connect the separate dies to create a multi-layer circuit board. When you say, “3D circuit,” people still think of stacked planar circuits, perhaps connected vertically using vias. The inability to shake off the 2D mindset has slowed the evolution of printed electronics technology, limiting how engineers and software providers use the third dimension. This is not to say that developers of the technology lack a vision of what 3D-printed electronics can be; far from it. Current printing technology and recent research developments offer a glimpse of what 3D electronics might look like. A look at some of the advanced printing technologies reveals differing perspectives on the form factors and architectures of 3D-printed electronics. Researchers at the University of Texas developed this 3D/volumetric circuit design tool by programming a custom add-on for the open-source, 3D creation software Blender. The tool imports component geometries and a netlist from a schematic capture tool, allows traces to be routed along any path throughout the volume of the part and exports CAD files of the multi-material part. Image courtesy of the University of Texas at El Paso. One of the most established methods of producing electronics is ink jet technology. These printers use an array of nozzles to propel small quantities of ink, typically using piezoelectric material to push the material through the small orifices. It delivers high resolution—enabling the production of crisp miniaturized components and traces—and good throughput. Nano Dimension’s systems use two families of inks. Optimized for a range of applications—from radio frequency identification components to antennas—the AgCite family of nanoparticle inks promises good conductivity, adhesion and flexibility. Unlike regular metal powders that require high sintering temperatures, these inks can achieve a sintering temperature low enough to support a range of substrates, such as paper, polymer, glass and indium tin oxide. The second family of inks uses a dielectric nanoparticle-polymer combination that provides electrical insulation down to hundred-micron widths. The inks are ultraviolet-cured as part of the print process. An alternative approach uses a technology called microdispensing. These systems typically use positive pressure to transfer small amounts (microliters) of print material through a small tip or nozzle directly onto the desired surface. The technology often lacks resolution and accuracy. On the plus side, however, dispensing can deposit much thicker layers of materials with much higher particle loading. This can make building 3D parts faster. Additionally, metal provides structural support, and has higher conductivity. A proponent of microdispensing, nScrypt, counters the technology’s shortcomings with the SmartPump, which controls the material volume flow at a pico-liter level (see video). This feature promises to enable precision printing at high print speeds, with clean starts and stops of the dispensing/printing path. Another strength of the technology lies in nScrypt’s Factory in a Tool suite, which is bundled with the company’s 3D printing and microdispensing systems. The tools support multiple methods of depositing materials, offer features like pick-and-place (see video), and perform post-processing functions such as milling, polishing and laser processing. Factory in a Tool accommodates many types of materials, including materials with high particle loading. Though nScrypt’s microdispensing technology is a layer-by-layer process, the Factory in a Tool suite allows the printing system to enhance 3D electronics production by interleaving disparate functions and processes throughout the operation. Though current 3D printing hardware is fully capable of producing 3D circuits, the transition to true printed 3D non-planar electronics has been slowed by the absence of adequate development tools. The reality is that the majority of investments and research still must be done in areas such as design practices, standards and manufacturing processes. Nano Dimension’s Switch software enables designers to prepare production files for electronic circuits to be printed on a DragonFly 2020 3D printer. Image courtesy of Nano Dimension. This approach handicaps development efforts, requiring designers to spend extra time making the workaround successful. Defining the necessary software and providing the actual tools are two different things. Research groups and AM technology providers, however, have begun to develop and introduce software that attempts to bridge the gap between traditional design tools and 3D printed electronics. For example, Nano Dimension offers two software packages targeting the 3D market. The first, a free add-in for SolidWorks, promises to provide a design environment optimized for 3D printing multi-material electronics (see video). The software aims to help engineers design complex prototypes—consisting of polymers and metals—that can be 3D printed on the company’s DragonFly Pro printer. The second, called Switch, offers a proprietary pre-processing application that enables operators to prepare printed circuit board designs for 3D printing on Nano Dimension’s printer. On another front, researchers at UTEP have begun to develop software that goes beyond enabling the design of circuits that conform to a surface and opens the door for designing and manufacturing 3D/volumetric circuits. The first software the UTEP research team developed is a CAD tool that lets engineers lay out 3D circuits and route interconnects. The tool helps place components in any position or orientation throughout all three dimensions. Interconnects of various types—such as high-frequency, power or thermal—can be routed to follow smooth splines. University of Texas researchers have developed a slicer for hybrid 3D printing that takes the output of the circuit design tool, slices the multi-material part and generates the g-code that automatically drives the nScrypt 3Dn printing process. The top-right window shows a CAD model of a parallel plate transmission line. The bottom-right window shows the part being sliced. The “digitization” in the bottom window indicates the toolpaths for dispensing (silver) and for fused filament fabrication (green). Image courtesy of the University of Texas at El Paso. 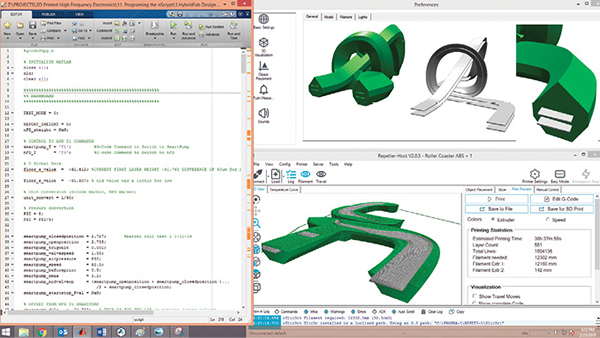 The second program is a tool that generates hybrid G code from CAD files, with arbitrary multi-material structures. “This tool allows us to drive multiple tools from a single g-code file without having to manually code anything,” says Rumpf. All of this came together during the summer of 2018, when the electromagnetic lab produced its first 3D/volumetric circuits. Of note is that these academic lab–based software systems are works in progress that have not been commercialized. Ultimately, the UTEP researchers plan to integrate all of the software tools and algorithms they have developed into a single, easy-to-use tool. Engineers pushing the limits of design to achieve the full potential of 3D-printed circuitry will have to approach the development process from new angles, and use new design rules. This means that designers will have to find new solutions for old issues. For example, heat management is already a problem in high-density and high-power electronics. Having embedded circuits precludes the use of traditional methods of managing heat like fans and heat sinks. For future printed structures, new heat management methods must be developed—possibly using micro-fluidic channels spread throughout the part to dissipate heat. It’s clear 3D printed electronics promise to redefine each stage of the development cycle. The additive approach has the potential to change workflows, turbo-charge development cycles and introduce new ways to make the unmakeable.